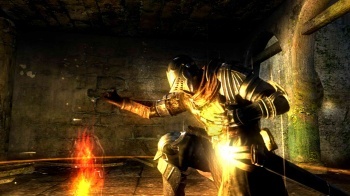 A number of very convincing indicators have cropped up over the last few days that seem to suggest Namco Bandai's masochistic dungeon romp Dark Souls is headed to the PC. Now keep in mind that none of what I'm about to tell you comes as an official confirmation that Dark Souls is coming to the PC. That said, I leave it to you to judge these intriguing hints for yourself. First up? An image from PC PowerPlay magazine, teasing the next issue with the words "You Died" in a font and color combination that should be all too familiar to fans of the notoriously difficult game. Second? A recent addition to the official Dark Souls Facebook page that tasks fans with "Liking" the page in order to break down a virtual wall, behind which lies a mysterious announcement. Third? Back in January, Dark Souls fans created a petition that garnered over 70,000 virtual signatures. This was enough to catch the eye of Namco Bandai employees who have been suspiciously mum on the issue ever since. Again, this is far from an official confirmation, but feel free to draw your own conclusions. At least until the time comes for someone to confirm our well-founded assumptions. Oh, and internet? Good job. I know we've had problems lately with your superfluous use of online petitions, but if this all pans out the way I think it will you guys and girls done good.